Chiropractic care looks at the nervous system and corrects any stress that has built up in the spinal column. The specific and gentle approach to chiropractic care that we use at Elevate Life Chiropractic is ideal for every member of your family. At our practice our preferred approach is TRT, which is a highly specific and gentle technique. It uses an FDA-approved instrument called the Integrator™. We can get directly to the source of the problem using the instrument. Our patients like the technique and have called it “fast, gentle, specific, precise, effective and reliable.” We agree! From relieving pain and promoting mobility to reducing stress and enhancing sleep, chiropractic yields a host of benefits. It’s also beneficial for moms-to-be as it diminishes aches and pains associated with pregnancy and decreases labor time. We also use the Webster Technique to promote optimal head down position. It’s our belief that the healthier the pregnancy, the healthier the newborn is. 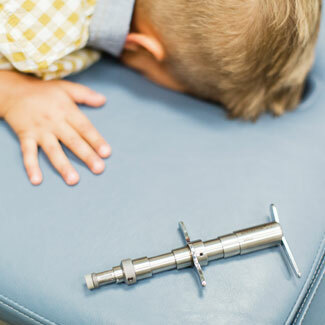 Children who grow up with chiropractic also tend to get sick less often as chiropractic boosts the immune system. Because every patient is unique, duration of treatment will vary from person to person. For patients in pain, we may see them frequently on a weekly basis and once again through the re-examination process. When patients improve, they will progress to maintenance or wellness care to ensure they stay healthy. If you and your family want to experience peak health, we invite you to book an appointment today in our Stevens Point practice!